It's almost certain the Samsung Galaxy Note 8 will be announced on August 23, but a new rumor suggests the phone will be released the very next day in the US. A Best Buy employee has claimed Samsung is ready to start selling the Galaxy Note 8 the day after the announcement, suggesting you'll be able to buy it on August 24. A Reddit post cited the employee and says the information has been confirmed by both Verizon and Samsung channels, which it's likely the Best Buy employee will have access to. However, don't read too much into this - we're skeptical about the claim as this is unlike anything Samsung has done in the past. Samsung usually releases all products in its home market of South Korea at the same time as other big markets for the company such as the US and UK, if not before - and we've heard rumor that the Note 8 is set to appear in Samsung's homeland a couple of weeks after launch. If the Note 8 were to be released the day after launch, that would be a lot of stock to be released a day after the announcement, and it wouldn't give the company much time to prepare. We're seeing a lot of leaks for the phone right now, but whether it has hit maximum production already is unclear. Samsung's Galaxy Note 7 was announced on August 2, 2016, but wasn't released to the market until 19 August that same month. That's a gap of over two weeks and proves it would be a major undertaking for the company to release the phone only a day after the announcement. The Galaxy Note 7 hit pre-orders of over 200,000 in South Korea while the Galaxy S8 hit over a million pre-orders in the same market over just two weeks. Samsung struggled to keep pace with those orders for the Galaxy S8 and had to delay the release in some markets because of it, so the company will have the play the release schedule for the Note 8 safely or end up disappointing a lot of fans. Our guess is that the Best Buy employee may have misunderstood the information they've seen. Samsung set pre-orders in the US live the day after the announcement for both the Galaxy Note 7 and Galaxy S8, so it may be the employee saw similar information for the upcoming Note 8. People often get mixed up with the terminology of release, launch and unveiling so it's entirely likely this is just an honest misunderstanding. On the other hand - it's not certain it won't launch on that day, as Samsung has never faced a situation like this before, releasing a pivotal product following a flame-based scandal. The Galaxy S8 and Galaxy S8 Plus were a relative success for the company, but neither of those products came with the Note 8 name. 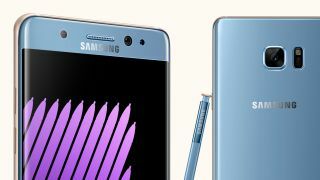 The Galaxy Note 7 catching alight was a major PR headache for Samsung and this is the first Note product to be released around the world since that problem. Maybe releasing right after the announcement and steering well clear of the rumored September iPhone 8 release is a smart idea - it'll just be new territory for the company.